Jesus never called us to fix our culture. He called us to replace it! Today, we face unprecedented challenges to our Christian faith. Many of these threats are obvious but the most dangerous ones are unseen or unknown. In The Clash of Kingdoms, we will expose the most powerful kingdom threatening the Church today. We will see how it has infiltrated the Western Church creating a contaminated religious culture. We will also see the power and majesty of God’s unshakable Kingdom that offers an amazing remedy. On the day of Pentecost, something happened that went beyond revival. There was a reformation of mind and heart. These young believers became citizens of a different Kingdom. They discovered a revolutionary way of life. As a result, they turned the world upside down or should I say right side up. They possessed a power that comes from seeing the world from God’s Kingdom perspective. The Clash of Kingdoms presents biblical principles long forgotten or neglected in our church culture. By rediscovering our New Testament mandate, we will be empowered to fulfill our spiritual destiny. This message can change your life. 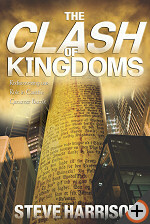 The Clash of Kingdoms is the sequel to Liberating Love and the final book in the Warrior Bride Series. “Let us be grateful for receiving a kingdom that cannot be shaken” (Heb. 12:28 RSV).